UPDATE: The $4.99 charging pad deal is now sold out, but the $9.99 fast charger is still in stock. UPDATE 2: They’re both sold out, but Amazon’s best-selling fast wireless charger is down to $14.99 today! EARLIER: Apple’s iPhone XR finally hits store shelves tomorrow, and the new iPhone XS and XS Max launched last month. There are also a ton of new Android phones coming out ahead of the holidays, as well as dozens more that have debuted in the past few months. Regardless of which new phone you get your hands on, you’re definitely going to need new wireless chargers to go with it. Lucky for you, Amazon is running two crazy sales that cover all the bases. For overnight charging in your bedroom, pick up a CHOETECH Wireless Charging Pad for just $4.99 with coupon code PS4JKAAF. Then for your desk or anywhere else you might want to charge your phone as fast as possible, grab a $19 CHOETECH Fast Wireless Charging Stand for just $9.99 with the coupon code MACHO524! 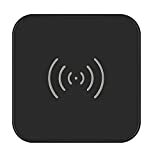 【About Brand CHOETECH】As the expert in wireless charging industry for more than 5 years, CHOETECH has already shared 70% of the international market, attracted more than 3,000,000 loyal users around the world. All these are obtained on the strength of our extremely premium products and fully considerate services all the time. 【Universal Compatibility】This qi charger works with fully Qi-enabled devices like iPhone X, XS, XS Max, iPhone XR, iPhone 8/8 Plus, Samsung Galaxy Note 9, S9, S9 Plus, Note 8, S8, S8 Plus, S7, S7 Edge, S6, S6 Edge, Nokia 9, Nexus 4, 5, Lumia 920 and other Qi-Enabled devices. 【Ultra Slim】0.3 inches thickness, through countless data analysis, we have designed the most suitable size charging pad, which is perfect for small places but it’s also big enough to put phone anywhere on it to charge. 【Intelligently Identify Charge Models】Fast wireless charge up to 10W for the Samsung Galaxy S9, S9 Plus, S8, S8 Plus, Note 9, Note 8, S7, S7 Edge, S6 Edge+, 7.5W wireless charging for iPhone X/ XS / XS Max/ XR/ 8/ 8 Plus ( QC2.0/3.0 adapter needed for fast charge) and 5W standard wireless charge for all Qi-enabled Phones. 【High-efficiency Charging Stand】Built-in 2 coils fast wireless charger stand allow to charge cell phones vertically or horizontally and provide you with more flexible choice for reading, listening to music, watching a video or work sessions. 【Case Friendly Design】Our wireless charger can identify your phone sensitively and support phone case within 5mm(0.2 inch) while 4mm(0.16 inch) is the best wireless charging distance (Please note that metal attachments or credit cards will interfere with charging ). 【Sleep-Friendly&Safe Protection】Built-in intelligent indicator shows you charging status, extremely soft green led light for well sleeping without distraction during sleeping at night,Multi protection system for all-round protection against over-charging, over-voltage, over temperature and over-current, provide a safe charge to protect your devices. 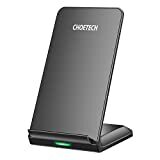 【What is in Box】1 x CHOETECH Fast Wireless Charger Stand, 1 x 3.3ft Micro USB Cable , 1 x User Manual,18-Month Warranty & 24*7 Friendly Customer Service.